Hi everyone! 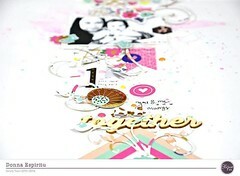 It’s Heather Doolittle back today with another page that I made using the June Aquarelle main scrapbook kit! I totally love these copper alphabet stickers from Pinkfresh Studio. They’re the perfect size for everything! And I love that there are so many in a pack! They will definitely stretch far on your projects. The little typewritten words are from THIS set of printables. As you can see, I added one to the title as well. They’re so perfect. I appreciate you stopping by to see what I made with this month’s Aquarelle kit! Categories: Design Contributor | Permalink.